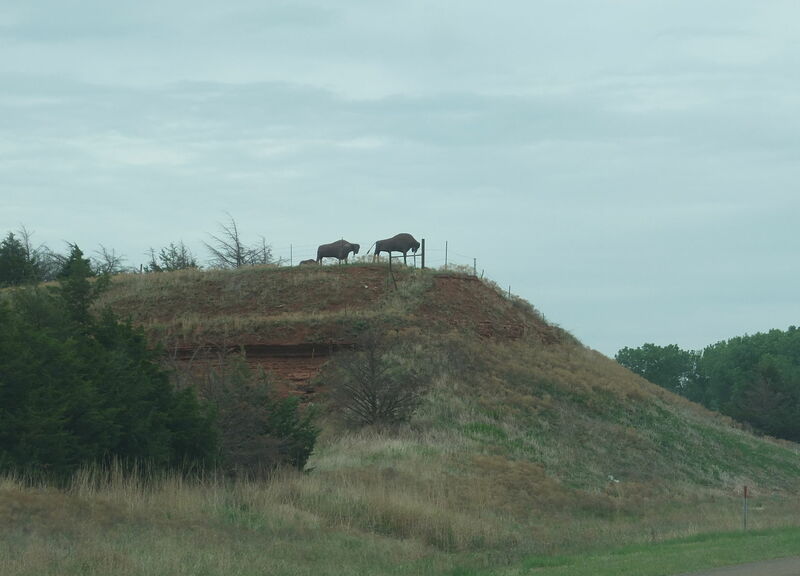 Smack dab in the middle of the contiguous United States, really in the middle of nowhere, you will find the strangest, most amazing, per capita city in the country – Lucas, KS. Population 393, give or take a person or two. 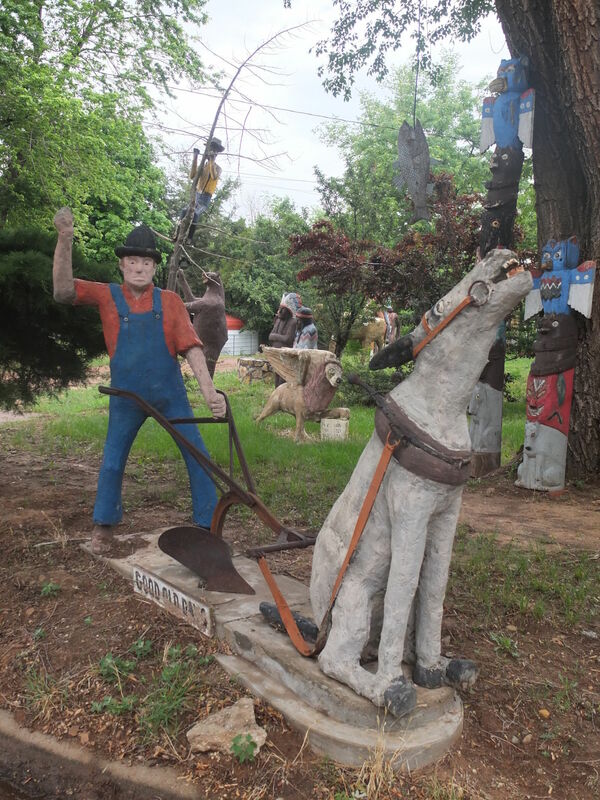 Lucas is home to three or four art environments (depending on your definition), a great folk art museum, a terrific meta roadside attraction and the coolest public bathrooms you could ever hope to do your business. All within a three block radius. New York City by comparison has a population of over 8.4 million people, probably at best has three or four folk art environments, also has a really great folk art museum and a few roadside attractions, but unlike Lucas all their public bathrooms are vile pits. Lucas is only 15 minutes from highway I-70, which cuts through the middle of the state, but unless you are driving from Denver to Kansas City, Lucas is most likely near nowhere you were planning to be. The closest “big” city is Wichita, KS, which is about 150 miles away. But in a way it doesn’t matter where in the United States you live, Lucas is not technically that far away. Lucas is located only about 60 miles from the geographical center of the contiguous United States (not counting Alaska and Hawaii). Meaning if you cut out a map of America and tried putting a pin in the middle so it balanced perfectly, the pin would just about be in Lucas. It takes a bit of work to get here, but as Lucas is such a fascinating small town, it is well worth your efforts. For fans of art environments this is an absolute must see. So, with that being said here is a travel guide to the wonders of Lucas. You can’t talk about Lucas without starting with this site. Built by S.P. Dinsmoor (1843 – 1932) over two decades starting in 1907, the Garden of Eden is arguably the oldest surviving art environment in the United States. The Garden is one of the greatest icons of the old, weird America, built with fervent individualism with a strong point of view, built with skill and imagination. Infusing concrete with a healthy mixture of populist politics, social Darwinist theory, old timey religion and freemasonry, Dinsmoor surrounded his hand-built cabin with hundreds of concrete sculptures. 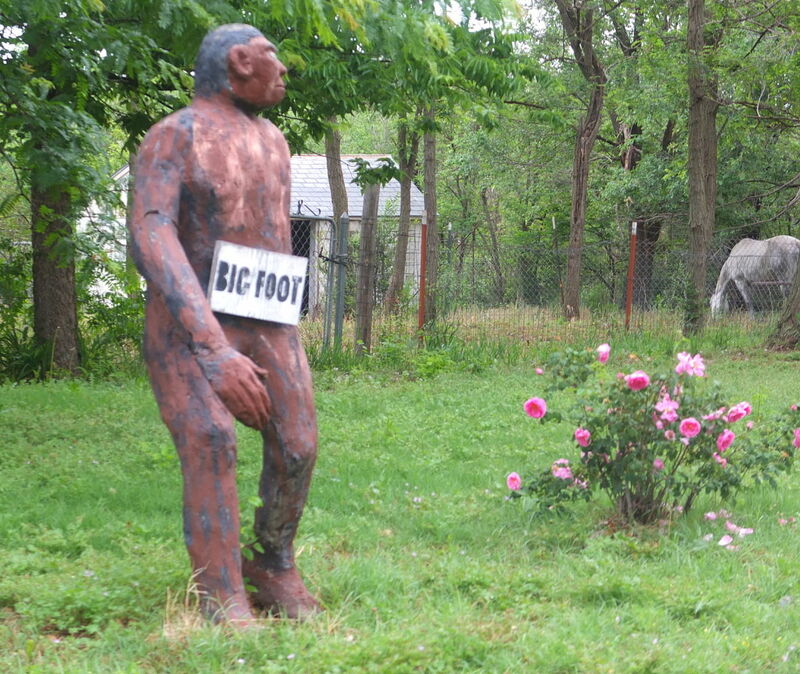 He was not afraid to speak his mind, then build it into a giant sculpture and place it on his property. For example, one of the more prominent sculptures is the one in the photo above, with labor being crucified by the bankers, lawyers, doctors and preachers (a big screw you to the man). Over the century Lucas residents have taken great pride in this site. 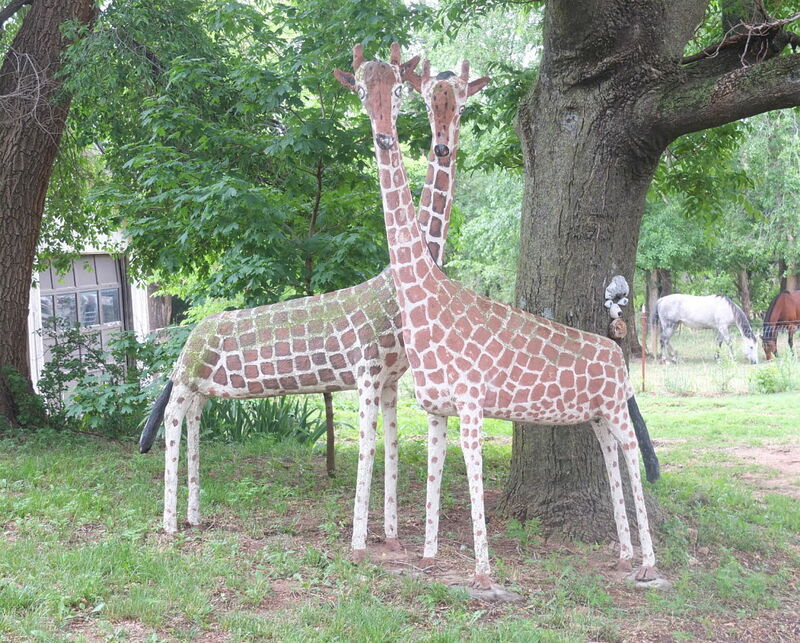 Dinsmoor’s creation inspired several of his neighbors to start building weird things in their yard, and inspired other artists to move to Lucas. The Garden of Eden was preserved by the Kohler Foundation in 2011 and is open to the public as a museum. With paid admission you get to go on the property, in the house and also get to venture into the mausoleum where Dinsmoor’s mummified remains rest comfortably to greet curious tourists. Check the website here for hours and admission. Two blocks from the Garden of Eden, on Lucas’ main strip is a fantastic art museum. I don’t know why I am even bothering listing the addresses, this town is only a handful of blocks squared, you won’t get lost. Lucas has been dubbed the Grassroots art capital of Kansas. 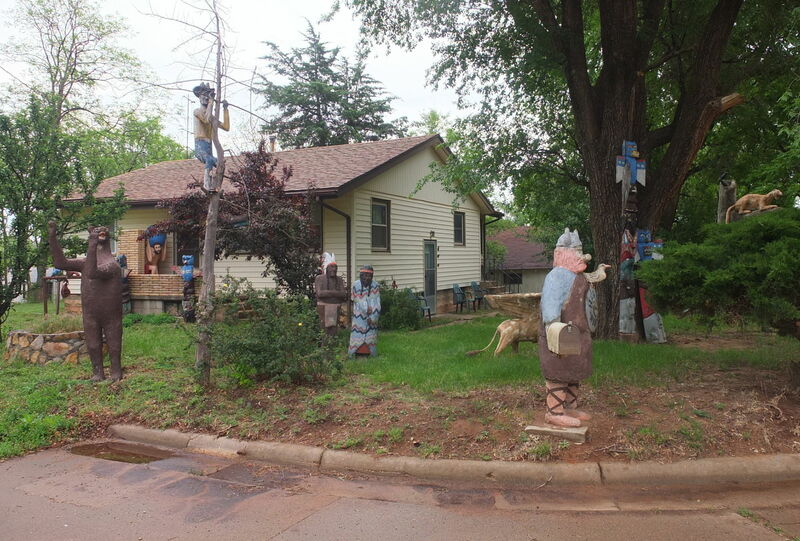 Basically, “grassroots art”, is Kansas code for folk, self-taught or outsider art. The term doesn’t carry any of the baggage of those other descriptors. The Center is a terrific folk art museum with pieces by several noted Kansas grassroots artists including Glenn Stark, Ed Root and M.T. Liggett. It is a cornucopia of people thinking outside the box. Admission to the museum gets you a tour of the next two places listed, Florence Deeble’s Rock Garden and The Garden of Isis. Check out their website for visitor info here. There are a few sites in Lucas that were directly inspired by SP Dinsmoor. Florence Deeble (1900-1999), built her art environment in her back yard, only a block from the Garden of Eden. She started creating her rock garden in her late 50s and continued till she passed away at almost 100 years old. 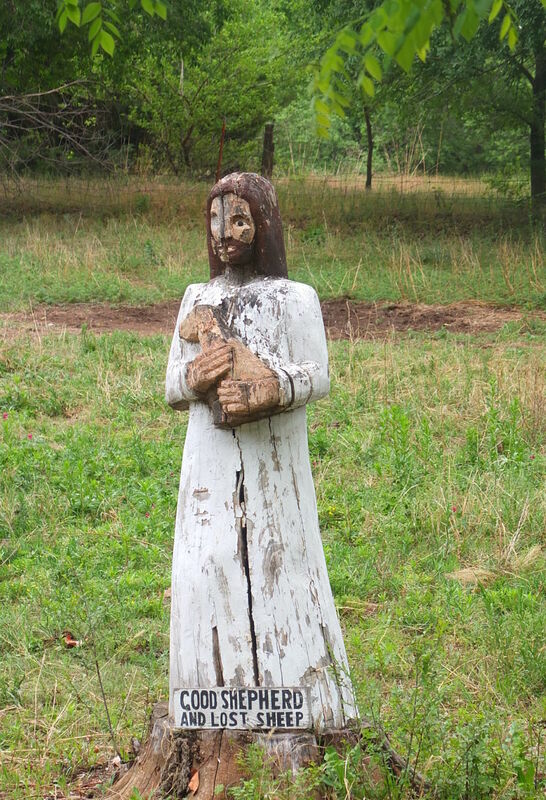 Many of the sculptures are inspired by her travels or by the history of Kansas, or Lucas. When she got older, she kept building and started incorporating other store-bought pieces into her sculptures. Deeble’s environment is a tad crude, but utterly charming and full of personality and creativity. Admission to the Grassroots Art Center gets you a tour of her yard. Artist Mri-Pilar was so inspired by the grassroots art in Lucas that in 2002 she started covering the inside of Florence Deeble’s house with her unique art. The interior walls are sheathed with silver insulation and weird collages often using doll parts. Very creepy and very cool. A tour of the house comes with your admission to the Grassroots Art Center. Ron and Clara Miller created a rock garden art environment/ tourist attraction from the 1920s to the 1960s. They built rock sculptures of places they have visited. 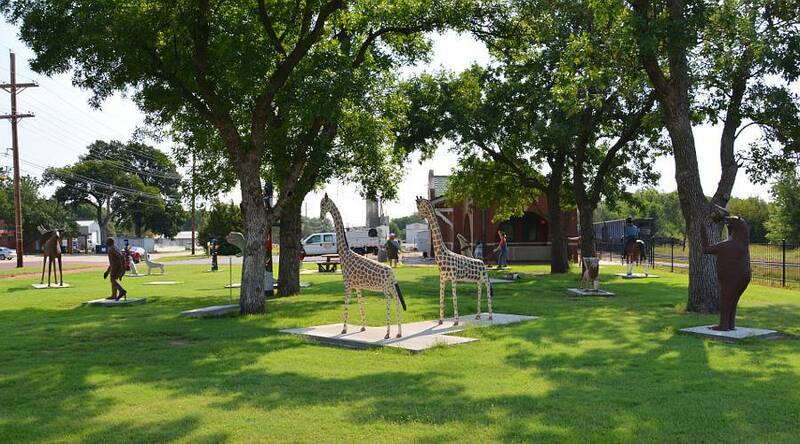 The sculptures were all sold off in 1969 and moved to Hays, KS. Forty years later, after being left to decay they were rescued with the help of the almighty Kohler Foundation. 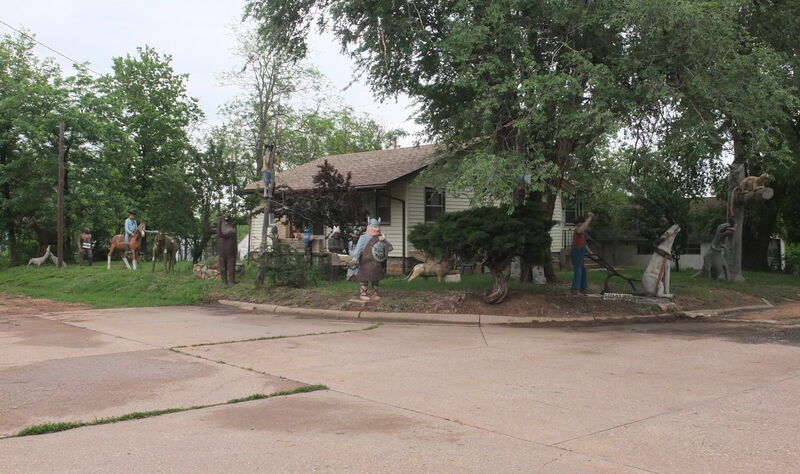 They were preserved and then moved back to Lucas in 2013. 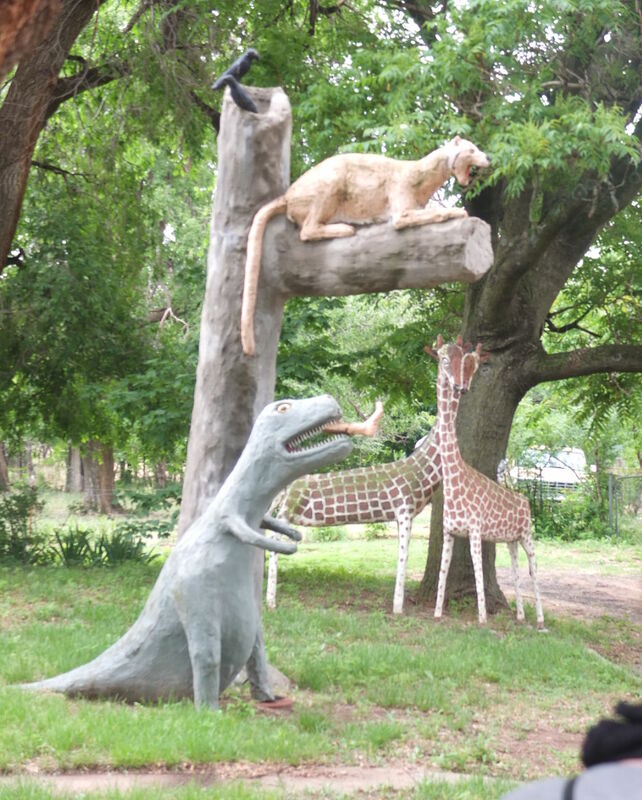 They are now adjacent to the Garden of Eden and free to check out daily. Artist/ educator/ preservationist/ road tripper and fellow art environment obsessive Erika Nelson has created a very cool roving tourist attraction that delights in roadside architecture, namely the “world’s biggest this or that.” Nelson is another transplant from elsewheres drawn to Lucas’ creative soul and super cheap rural housing prices who bought the house next to the Garden of Eden to act as her jumping off point for her travels across America. These giant pieces of Americana are everywhere. Every state has them, often built to lure in tourists, or as a point of community pride. Some of the more well know ones include the World’s Largest Ketchup Bottle in Illinois, or the World’s largest dinosaur, aka the Cabazon Dinosaur, as seen in the movie Pee Wee Herman’s Big Adventure. Nelson has built a mini version of these archetypes of Americana and is displaying them in the windows of her art cars and on the side of her house. Incidentally Lucas is located about a 45 minute drive from one of my favorite World’s largest thing, the World’s Largest Ball of Twine (built by more than one person) in Cawker City, KS. Check out her website here. Besides all the attractions listed above, there is the Bowl Plaza, a public restroom on Main street, a block down from the Grassroots Arts Center. This is not a normal bathroom, I mean in may ways it is as it relates to hole placement and flushing gadgets, but each restroom has been covered with tons of bric-a-brac – an homage to the grassroots art that informs the small burg’s sensibilities. There is a tiny park next to the bathrooms that has more grassroots art. There is also a great 90 plus year old family run Czech meat market named Brant’s right next door, where they sell incredible bologna, beef jerky and other sausages. Brant’s is located at 125 S Main St, they don’t have their own dedicated website but here is a good site for more info. But wait there’s more… all around town and on the roads going to and from Lucas there is more grassroots art. There are M.T. Liggett totems, and J.R. Dickerman’s Open Range Zoo, basically, several grassroots metal sculptures that litter the roads leading into Lucas. You can find a list of Open Range creatures here. If you love road trips and art environments then this here is the destination for you. Kansas City or Denver both make great jumping off points as there is a ton of fascinating Americana and grassroots art sites along the way. So, check out the Kansas map below (Lucas is in about the middle) and then fill up the gas tank, it is a bit of a drive.